Last week we started a series in lead generation for the non-marketer. If you’re still wondering what lead generation is and how it works, check back to the first post in the series, Lead Generation: Learn What Marketers Already Know. I gave an example, briefly, of how lead generation works and a common strategy used. In this post, I’ll cover 10 examples that really work to bring in leads. If you have any questions, hit us up on Twitter with hashtags #leadgen and #343, or send us an email at info @ level343 dot com. Hundreds of strategies have been tried and failed, but others have proven themselves time and again. 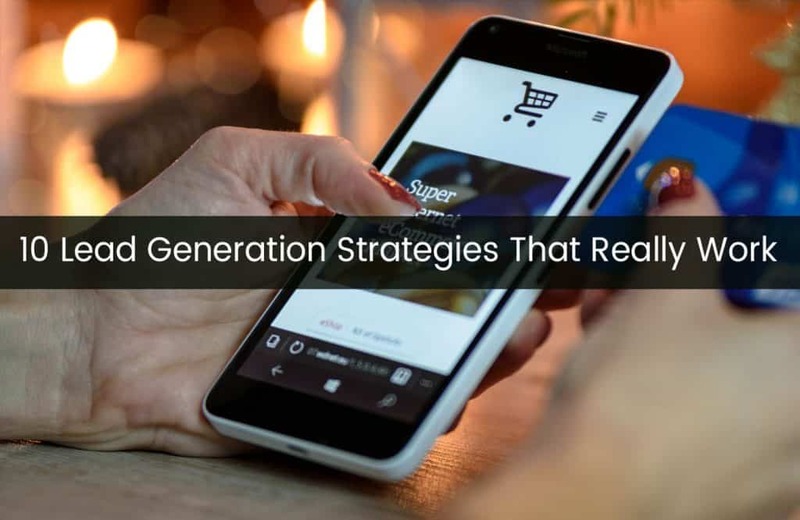 If you’re struggling with how to build your customer base or contact list, give these lead generation strategies a try. You have a visitor sitting on your site. They’re already there, so they’ve shown a bit of interest. What now? How do you get that lead? How do you turn a stranger into a name and address? Some people may genuinely want to finish reading that 2000-words article you painstakingly wrote, but time is moving fast. 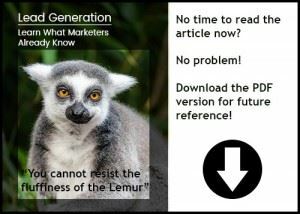 Reward your visitors (and get their contact details) with a PDF version of the article. If you write your articles in a Word document before you upload them, it’s extremely easy to move them to PDF. All you have to do is save them as PDF. If your blog post provides readers with an informative list of some sort, be it how-to tips, strategies, or other information, creating an offer for bonus points is a great content upgrade. Your readers have already gone down to the end of your post, so you know they’re interested in the content. Provide a few tips as gated bonus. The call to action is focused on the content immediately at hand; conversion is typically higher than if it the information being offered is on another topic. Some blog posts are perfect for a “DIY Material” content upgrade. If your post is about tracking your social media efforts, for example, a gated template that helps your visitors do just that is added value. In short, if you can help your visitors carry through with what you’ve shown them how to do, they’ll be much happier with sharing their information (as well as coming back for more). Infographics are powerful things; we humans love pretty pictures, and they make it easier to absorb information. If you have a lot of information, gated infographics area an excellent tool. Create your infographic and share it as a small image. Offer the larger version as a gated asset. While this may only gather a trickle of leads (or a lot of leads, depending on the industry, time of day, moon and tides…), these are “set it and forget it” type lead gens. In other words, once you’ve set it up, you don’t have to do anything more until it’s time to update the infographic with new information. If you have an eBook with chapters, offer the first chapter for free with a list of what they’ll find in the following chapters. The book itself is locked away behind a gated page. Now, you may think, “where am I going to find the content for an eBook?” Again, The Publisher’s Guide to Repurposing Content is a great resource. If you’ve ever written a blog post series, you have the information for an eBook. Although the information is already provided on your website, putting it in eBook form gives visitors an easier way to get the information. It’s gathered all in one place. As well, you can add a bonus chapter that hasn’t been included anywhere on the site – i.e. never been published. If you’re a strong enough writer and the topic is a good one, that alone will be reason enough to offer their information. Case studies aren’t for everyone. Let’s face it; a parent buying a jungle gym for their kid isn’t really going to be interested in a case study about it (well, most won’t be). However, if you have a service-oriented business like we do, case studies and reports are booming lead generators. If you’re not too shy to get behind a camera, videos and webinars are a good choice for lead generation. Depending on your industry, screencasts (recordings of your actions on a screen) are also a possibility. The more value you give your visitors, the more likely they’ll provide their information, so make sure it’s a worthwhile offering. I know what you’re thinking – what kind of “strategy” is an updated call-to-action? Well, my friends, you’d be surprised to find out how much better your conversion results could be with improved CTAs. Look at your call-to-actions. Do they draw the eye’s attention? Are they interesting? Do they pinpoint related, interesting content? No matter what you’re asking for, your conversion points are only as good as the CTAs that lead to them. If you have call-to-actions that aren’t converting, update them. If you aren’t sure what a good CTA is, HubSpot’s 31 Call-to-Action Examples You Can’t Help But Click is an informative read. Have you ever had a popup occur as you got ready to leave a site? They aren’t near as annoying as the popups that happen as soon as you reach a site. After all, when are you more informed as to whether you want to subscribe or not? OptinMonsters’ 40 Exit Popup Hacks That Will Grow Your Subscribers and Revenue describes several ways to use an exit popup. When you read the post, make sure you check out what they have to offer. OptinMonster is a leading lead generation platform, is easy to use, and easy to learn. Most social networking platforms also have social marketing possibilities. If you’re using social media marketing, see what’s possible with your networks. Facebook Business is the best place to start to learn how you can use this oh-so-successful social platform for lead generation. Twitter for Business also has a dedicated area on how to use Twitter to increase the success of your social lead generation. LinkedIn has Business Solutions and Small Business Solutions to help you get the most out of their platform. Google My Business, not to be outdone by anyone, also has its setup, of course. If you’re using social networks and you want better lead generation from them, make sure you don’t ignore the links above. They’ll give you in depth information on using them to get the lead conversions you want. You can’t pull visitor information out of thin air, but you can increase the possibility of your visitors giving it to you. The lead generation strategies above are just a few, but they’re very strong examples of what works. I hope they’ll inspire you to explore the possibilities. In the next post of our Lead Generation series, I’ll focus on forms. How do you decide which form to use? How long should your form be? What should it look like? Stay tuned, and if you haven’t read the first part of this series, head on over to Lead Generation: Learn What Marketers Already Know.